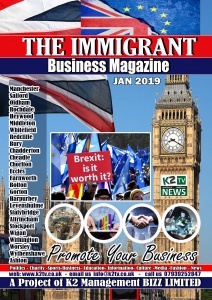 K2 Presents “THE IMMIGRANT BUSINESS MAGAZINE JAN 2018”. 10,000 free copies will be distributed in the Northwest of the UK. You can advertise your business, your products and your services in it. Great opportunity for your business to grow in the north west of the UK. Your advertisement will be printed and distributed in 10,000 copies. Your chance to grow your business in the Northwest. 10,000 free copies will be given to public. We will deliver your business, your brand, your product, and your services in 10,000 homes. Your advertisement will be displayed in 10,000 copies. Grow with us every day everywhere. 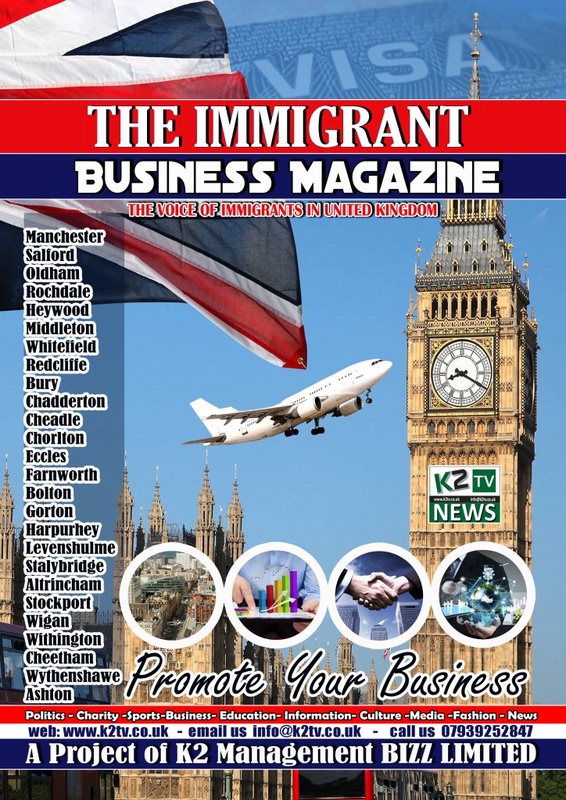 We will distribute 10,000 free copies of this Magazine in the United Kingdom. Our target is to cover every single town of Northwest and especially Greater Manchester. Here is a complete list of the Towns. Stockport, Stoneclough, Stretford, Timperley, Tottington, Walshaw, Waterloo, Westhoughton, ,Wigan, Withington, Worsley, Wythenshawe. Your business advertisement will be displayed free in our online edition. We have 10% discount for our existing customers to make sure they appear in our all projects. This discount applies on full page advertisement only. 50% deposit is required in advance. Remaining balance must be paid before the print deadline. The Immigrant book was published in 2014 and today its available in 17 languages 142 countries around the globe. Over 2000 copies were sponsored by Greater Manchester Business community in different events and given to public during information events. We setup a News website www.k2tv.co.uk in December 2015 and we started working with diverse communities of Manchester in March 2016. Today we have over 100K viewers every day on our website. We had printed 80,000 Ramadan calendars in 2016, 40,000 in 2017 and distributed in 57 towns of Northwest UK. August 2016/ 2017 we have designed a booklet to promote Pakistan. 20,000 free copies distributed todate. We have also distributed this booklet in Masjids, Super Markets and chain stores. We have over 7000 followers on our LinkedIn account. We have over 5000 followers on our official Twitter. Youtube: Our News is uploaded on daily basis to our YouTube account. We have 201,957 followers to date.